This installation was part of ‘The Source of Inspiration’ exhibition at Mount Venus nursery on September 27th and 28th 2014. The exhibition featured work from 5 artists, featuring photography, sculpture, glass, photography installation and prints. 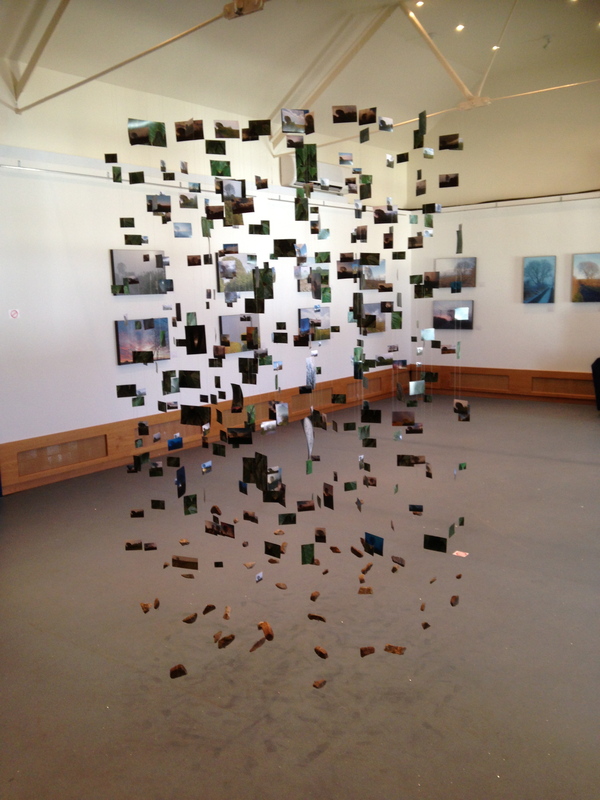 A mobile, featuring each of the 365 photographs from the oneTree365 photography project. Each image is printed on card of varying sizes from postage stamp size to postcard size. They hang in the air, moving on the breeze and twist and turn like falling leaves. The subject of the oneTree365 project is a native willow tree growing on the narrow country road where I live. In botanical and horticultural terms it is rather unremarkable, but for me it is a special tree. It stands proud and above the hedgerow, a marker for my home coming, my focal point of view as I travel on the road. All year round it stands beautifully, naked in winter when it displays its skeletal structure and filters the rising sun. And in summer clothed in green, its leaves are the signs of life and vitality soaking energy from the summer sun. The exhibition featured three visual art elements, photographic work, projected slideshow and hanging installation. 12 canvas prints representing each month of the year chosen from the 365 photographs. My aim from this project was to connect with the tree on a daily basis, to spend time observing the tree, appreciating its intrinsic aesthetic, and observing it as part of the landscape below the ever changing skies. Through documenting this process I can share the experience with others and encourage my fellow humans to acknowledge the beauty of trees, nature and the ordinary things that are part of nature’s s brilliance. Each day, our lives are made up of individual moments linked together through are existence and experience. 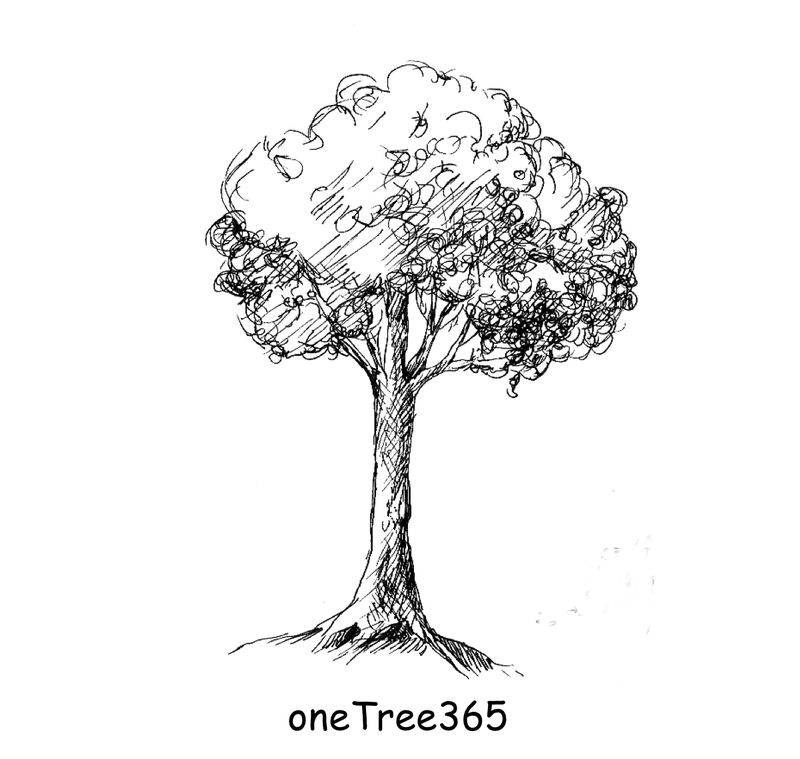 Each day we can make time to connect with nature and beauty, oneTree365 is my year of moments shared with a tree. Workshops were open to the public and are free. Bookings for school groups and other groups are available in mornings. oneTree365 – 3rd December 2013 – THE FINAL PHOTO!! !